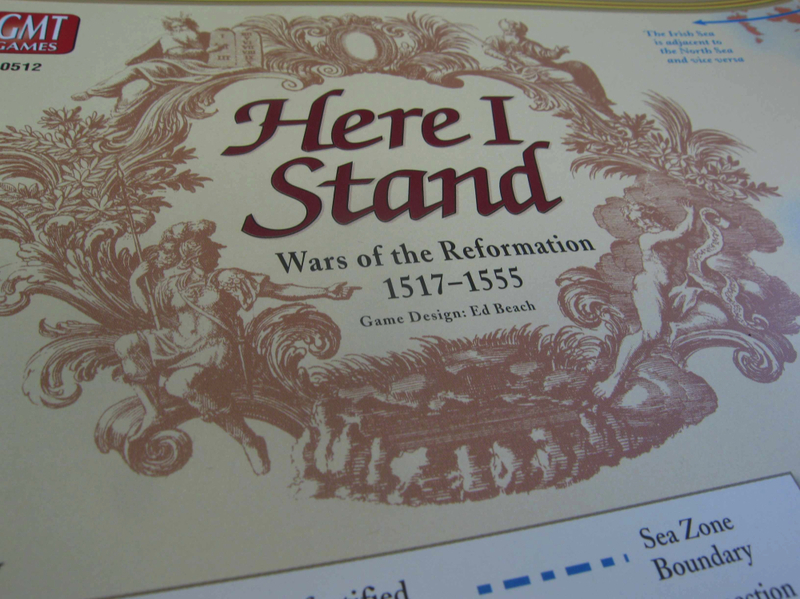 Here I Stand: Wars of the Reformation (1517-1555) is the first game in over 25 years to cover the political and religious conflicts of early 16th Century Europe. Few realize that the greatest feats of Martin Luther, Jean Calvin, Ignatius Loyola, Henry VIII, Charles V, Francis I, Suleiman the Magnificent, Ferdinand Magellan, Hernando Cortes, and Nicolaus Copernicus all fall within this narrow 40-year period of history. This game covers all the action of the period using a unique card-driven game system that models both the political and religious conflicts of the period on a single point-to-point map. There are six main powers in the game, each with a unique path to victory. The Ottoman player needs to bring Christian Europe to their knees, either through a dominant military victory in Central Europe or by naval conquests and piracy in the Mediterranean. Their corsairs, based initially along the Barbary Coast of Africa, are the only units that can steal resources (cards, fleets, or victory points) from other players through piracy. The Hapsburgs begin the game in a dominant position, with Charles V inheriting lands in Castile, Aragon, Burgundy, the Netherlands and Austria. As the newly-elected Holy Roman Emperor, Charles is also in charge of the defense of Germany. However, the Hapsburgs are spread thin and threatened on all sides, tasked with defending Europe from the Ottomans, protecting Italy from the interests of the French, and cleansing Germany of the rapidly developing Lutheran heresy. Only through diplomatic finesse and the establishment of a New World empire will they be able to continue in their ascendant position. The English player, taking the role of Henry VIII, is tasked with securing his dynasty and raising the stature of England in European politics. The English start the game with the fewest cards of any power but can increase that through conquest of Scotland or colonizing the New World. They often serve as the swing player in the struggle between the Hapsburgs and French. The English player has to balance these interests with Henry's need to spend time securing a male heir (gained through rolls on the Henry's Wives' Pregnancy Chart). In the end, Henry is the key, for he is the one dynamic military leader the English possess but he can not marry a new wife if he is captured or under siege. The third participant in the race to the New World is the Valois dynasty of France, led by Francis I. Like the English and Hapsburgs, France gains both victory points and additional cards through conquest, colonization, and exploration of the New World. Francis is also a great patron of the arts, taking a great interest in the art and architecture of Italy while starting the long succession of French chateaux. French strategies in Here I Stand vary widely, for victory can come through any combination of points from New World exploits, chateaux-building, and conquest of European city-states. The final two powers, the Papacy and the Protestant, fight the religious struggle that occurs concurrently with the rest of the action. The initial move of the game sees Martin Luther posting his 95 Theses on the church in Wittenburg, typically flipping religious control of several nearby spaces to the Protestant player. Religious conflicts use a proximity system to model the likelihood of religious conversion. If Protestant spaces, reformers, and armies are adjacent to a city, the chance of those townspeople also adopting the new faith is increased. Catholic spaces, armies, and Jesuit universities allow the Papacy to halt the spread of the "heresy" and counter reform spaces back to the Catholic faith. The religious conflict system includes factors such as the publication of biblical translations in one language at a time, the benefits of the printing press, and landmark events in the history of the Reformation such as the Diet of Worms and the Council of Trent. If one side finds itself blocked from advancement, they can raise the stakes and call a theological debate. Here the leading Protestant reformers meet the Papal legates in a battle of words, with the winner (measured by the number of debate "hits" rolled) gaining new converts. If the victory was lopsided, the loser suffers disgrace or death by burning at the stake. Progress toward victory for these two powers is measured by the number of areas under religious control and the number of enemy debaters burned or disgraced. Here I Stand is the first card-driven game to prominently feature secret deal-making. A true six-sided diplomatic struggle, the game places a heavy emphasis on successful alliance-building through negotiations that occur away from the table during the pre-turn Diplomacy Phase. Set during the period in which Niccolo Machiavelli published his masterpiece "The Prince," backstabbing is always possible, especially because the card deck is loaded with event and response cards that can be played by any power to disrupt the plans of the powers in the lead.